The Mayan civilization is considered among the most advanced civilizations to have appeared in Mesoamerica. Mayans excelled in many different fields and achieved extraordinary feats. They were able to develop a language of their own, constructed huge pyramid-temples many of which are extant even today. Mayans were expert astronomers and this helped them created one of the most accurate calendars of pre-modern period. They also achieved many innovations in agriculture. Language was one of the most important achievements of the Mayans. Not only were they able to developed a written language, they enhanced it so that it was a very complex language which could communicate a lot of detail in writing. The language comprised of symbols, or hieroglyphs, which conveyed both phonetic and symbolic meaning. It was thanks to this well-developed language that the Mayans were able to create a vast body of written literature in books which they called codices. Developing a well-functional and stable government style was another major achievement of the Mayans. Typically, Mayans were grouped as city-states in Mesoamerica. If one city-state rose in power and influence, it subjugated other states through warfare or diplomacy. In the latter case, other city-states then had to pay tribute to the powerful state. Each city-state itself was ruled by a ruler who had royal privileges and was associated with religion. The rule passed on along the hereditary ruling line. This enabled stability of city-states and made it possible for Mayans to create large Empires. Mayans had a legal system which was very well-structured. They had clearly promulgated laws which had to be followed by all the citizens. Punishment for the violation of laws was swift, and often harsh. However, punishment was given only after a case had been tried in Mayan courts. There were lawyers who presented evidence against the criminal and those who pleaded in his favor. In the end, the Mayan judges made the final decision. If a criminal was dissatisfied with the verdict, he could appeal to a higher court. Mayan monumental architecture is one of the most stand-out features of the Mayan civilization. Mayans were expert builders and they constructed huge pyramid-temples, palaces and other kinds of monumental structures. They incorporated many extraordinary features into their architecture, such as astronomical elements, stelas and hieroglyphic art conveying historical information. Notable examples of Mayan architecture can be found in modern-day Mayan ruins of Calakmul and Chichen Itza. Mayan society was agrarian, so it had to rely on agricultural produce year after year for its food needs. A year with less rainfall posed significant problems for such a society. Mayans resolved this by making use of their architectural prowess. They built large underground reservoirs of stone and lined them so that they were totally water-proof. The reservoirs were connected to different waterbodies so that water flowed into them and was automatically stored. This water was then supplied to Mayan cities and consumed during times of scarcity. Mayans had a fairly advanced number system which they used for different computational tasks. Unlike many old civilizations, Mayan civilizations not only invented the concept of zero on their own but also understood and used it in their mathematical computations. The number system was a base-20 system and Mayans frequently used it in their astronomical calculations. 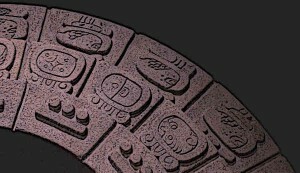 Mayan calendar was one of the most notable achievements of the Mayans. Mayans had an extensive knowledge of astronomy. They closely monitored and studied the movement of astral bodies, having constructed many observatories for this purpose. Based on their astronomical knowledge, they were able to create a calendar which was not only very well detailed but also incredibly accurate. The calendar used three dating systems in parallel called Divine Calendar, Civic Calendar and the Long Count. The Civic Calendar was used for daily computations of date, the Divine Calendar was used to denote the dates of religious events and the Long Count was used by Mayans to measure larger periods of times. Based on their extensive astronomical knowledge, Mayans were able to construct such structures which took into consideration astral movements. For instance, the Castillo pyramid-temple at the Mayan ruins of Chichen Itza was constructed so that one of its sides cast a serpent-shaped shadow on the opposite wall on the equinoxes and solstices. This required accurate consideration of solar events and a minute adjustment of construction plans to these calculations. Similar construction features related to astronomical movements were built into Mayan structures all over Mesoamerica. Mayans made a number of innovations in many different fields. In agriculture, they made use of slash-and-burn method to improve harvest. This method involved growing crops on a piece of land for two seasons and then burning the crops. This method then provided a new layer of alluvial soil for subsequent harvests. Mayans also made many indigenous inventions in creating different colors. The most notable of these is the color typified as Mayan blue. Mayan blue was created by using indigo and bound so that it took on a lighter shade and became very durable. Mayans also made use of mica and rubber. Mayans developed extensive networks of roads for trade and travelling purposes. These roads were usually built with limestone on top of a stone base. Mayan built these roads inside their cities, connecting different parts of the city. They also built these roads between major cities and some of these roads were as long as 300 km. Many of the sacbe built by Mayans are still extant today. Mayans were daring innovators in many different fields and secured many achievements in agriculture, architecture, astronomy and mathematics. They were able to develop a very complex and effective hieroglyphic language which was used for writing. A number system also existed in the Mayan civilization. It was a base-20 system which had an advanced concept of zero. Mayans also had extensive knowledge of astronomy and they used it to create a complex, accurate calendar. The knowledge of astronomy was also incorporated into monumental architecture built by the Mayans.